Two of the most mysterious phenomena in astrophysics are dark matter and dark energy. Dark matter is what holds galaxies together, and causes them to clump into clusters and superclusters. It is known as dark matter because it doesn’t interact strongly with light. 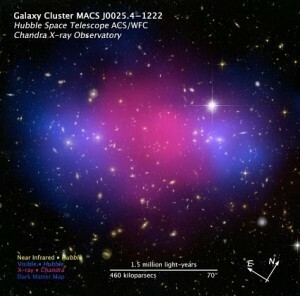 Dark energy, on the other hand, causes clusters of galaxies to expand away from each other. The resulting cosmic expansion is why distant galaxies appear to be racing away from us. 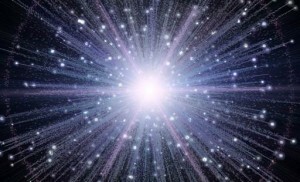 Because both of these phenomena are central to the structure of the cosmos, there have been several attempts to connect them into a single phenomenon. Now a new paper in Physical Review Letters proposes that decaying dark matter may produce dark energy. This new paper has led to popular science headlines wondering “Is dark energy eating dark matter?” but that’s not what the paper claims at all. In the paper the authors look at three sets of data: fluctuations in the cosmic microwave background, observations of distant supernovae, and redshift data from distant galaxies. In the standard model of cosmology, known as the ΛCDM model, these three data sets should be related, and if you plug the data into the model they should give the same results. What we find is that they almost agree, but not quite. This is not to say that they contradict each other, simply that they don’t agree as well as the ΛCDM model says they should. This slight disagreement between datasets is known as tension in the model. There have been various proposed solutions to easing this tension, such as factoring in neutrino mass, but in this new work the authors propose resolving it by connected dark matter and dark energy. To do this they tweaked the ΛCDM model slightly. The Λ or “lambda” in ΛCDM represents the cosmological constant that drives dark energy. The CDM stands for “cold dark matter,” which is the leading model for dark matter. In the standard cosmological model these two are separate and constant, but the authors proposed that dark matter could decay into dark energy (by some unknown process) so that over the history of the universe the Λ would increase while the CDM decreased. The decay of one into the other would be slow, but the authors found that such a decay would ease tension in the observational data. It should be pointed out that this doesn’t prove such a decay occurs, only that tweaking the standard model in such away seems to better fit the data. Tweak theories are weak theories, as I’ve said before. But what this new work does show is that modifications of the standard model are something worth exploring. As we strive to solve the mysteries of dark matter and dark energy, they may turn out to be two sides of the same coin.